In response to President Trump’s second Executive Order designed to keep individuals from hostile nations from entering the United States, the Attorney General of Hawaii announced he will file suit against the Trump administration. The plaintiff listed in Hawaii’s lawsuit is Dr. Ismail Elshikh, the Imam of the Muslim Association of Hawaii. The Muslim Association of Hawaii is a Muslim Brotherhood organization, which means the Muslim Brotherhood is directly confronting the President of the United States and challenging his authority. The address of the Muslim Association of Hawaii is 1935 Aleo Place, Honolulu, Hawaii. The property records for Honolulu reveal this property is owned by the North American Islamic Trust (NAIT) – the bank for the Muslim Brotherhood in North America. You can search the address HERE for yourself. NAIT was created in 1973 by the Muslim Brotherhood’s Muslim Students Association per their own website. Evidence entered in the largest terrorism financing and Hamas trial ever successfully prosecuted in American history (US v Holy Land Foundation for Relief and Development, Dallas, 2008) – 15 year FBI investigation – identified the North American Islamic Trust (NAIT) as a member of the U.S. Muslim Brotherhood which directly funded Hamas (TERRORISTS) leaders and organizations. On the last page of the U.S. Muslim Brotherhood’s strategic document (An Explanatory Memorandum), the MB identifies NAIT as one of their organizations. The stated objective of the Muslim Brotherhood in the United States is to wage civilization jihad “by OUR hands” to overthrow our government and replace it with an Islamic government ruled by sharia – Islamic law. See “An Explanatory Memorandum” page 7 of 18. The US v HLF evidence revealed that all of the prominent Islamic organizations in America are a part of the Muslim Brotherhood’s Movement here, including NAIT. NAIT’s financial records – entered into evidence at the HLF trial – reveal NAIT directly funds Hamas leaders and Hamas, a designated terrorist organization. See the records here and here. 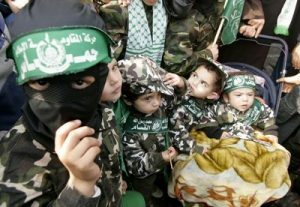 Children trained by Hamas. NAIT directly funded Hamas and Hamas leaders. Because of the massive evidence revealing NAIT is a Muslim Brotherhood organization which directly funds terrorism, the U.S. Department of Justice lists NAIT as an Unindicted Co-Conspirator in the largest terrorism financing and Hamas trial ever successfully prosecuted in American history (US v HLF). See the Unindicted Co-Conspirator list here. NAIT is listed on Page 8, paragraph VII. Being named an “Unindicted Co-Conspirator” means the government has enough evidence to indict but decides not to at that time. In fact, after the HLF trial ended in November of 2008, the Department of Justice moved forward to prosecute the founder of the Council on American Islamic Relations (CAIR) and CAIR itself, but after approximately six months, that effort was shut down by Attorney General Eric Holder and since that time none of the hundreds of unindicted co-conspirators have been prosecuted by the Department of Justice. The “parent organization” to which the U.S. government is referring is the Muslim Brotherhood. HLF and IAP were Hamas (TERRORIST) organizations. This ruling declares NAIT is directly associated with the terrorist organization Hamas headquarters overseas and its front organizations in the United States. It should be noted, Hamas is an inherent part of the Muslim Brotherhood. The Muslim Association of Hawaii is a NAIT property. The leader of this organization, Dr. Ismail Elshikh, has led several other Muslim Brotherhood organizations and would not hold those positions if he himself were not a Muslim Brother. The Department of Justice should indict NAIT and the affiliated Muslim Brotherhood Islamic Centers, mosques and other organizations, arrest all Muslim Brotherhood leaders in the United States, legally seize all NAIT and Muslim Brotherhood property, and utterly dismantle their jihadi network. If this offensive assault by the Muslim Brotherhood against the President of the United States and his effort to secure our nation and keep our enemies out is not met with significant force by the U.S. government, the Muslim Brotherhood will view this as more weakness and push harder and more violently in the coming months. Hello, While I have been glued to watching the hearing about the investigation by the FBI of a Trump / Russia collusion (I don’t believe), but….a Ohio Republican Wenstrup, while visiting another state had the Iraqi Ambassador ask to have a meeting with him, so instead of a Russian, it appears the other enemy of the U.S Iraq, is not Russian. that …but taht has connections to the OIC. Wow….Comey could not answer if he, Wentrup, could meet with the ambassador of Iraq,without triggering a investigation on himself. Wow !!! Not too many investigations of democrats meeting apparently something smells bad and looks foggy. ….but FISA requests by prior administration maybe… hopefully Trump overcomes this is a problem…..just before elections again. The MB has a purpose to influence elections, influence information, court decisions of travel bans, media events, politicians and religious leaders of Christian and Jewish communities, schools, and real estate, medical, medications used, the list is endless. The main job is to promote Islam as peaceful, so as the protests and misinformation appear to influence hopefully facts will arise. In the future it would sure help to expand vetting to of presidential appointments before approval so the smears in future cannot continue if possible. Inasmuch as the Muslim Association of Hawaii is an entity of the unindicted terrorist organization known as the “Muslim Brotherhood”, Imam Ismail Elshikh may have unwisely embarked on a dubious endeavor requiring him not only to cling tightly to the “tale” of a renegade misfit in dire need of conspiratorial assistance, but has also neglected to consider the ramifications which may ensue when an acquaintance of his, Hakim Ouansafi, will be forced to testify that notwithstanding his voluntary chairmanship of same said Muslim Association of Hawaii; his voluntary Board membership for the Hawaii chapter of the federal law-enforcement foundation; and the fact that he is also a civil service commissioner with the city & county of Honolulu, in 2011 Ouansafi was criticized for having misrepresented in 2009 Mohammad’s arrival in Medina in order to manipulate the Hawaii legislature into passing a resolution designating September 24 2009 as Islam Day in Hawaii. I.e. he did so by falsely claiming that a “Julian” date in the year 622 A.D. was actually a “Gregorian” date; when in fact September 24 2009 is actually SEPTEMBER 11 2009 in the old Julian calendar” — I.e. 9/11 (RIP). Furthermore, since consequent of blatant defiance of federal law the Attorney General of Hawaii appears to be blithely engaged in criminal collusion with intent to usurp the authority of the President of the United States in matters of national security — which only said official, and he ALONE — is delegated by the Constitution to exercise, the American population has been demonstrably rendered less safe on behalf of a sociopathic illusion that somewhere in time an unidentified & un-vetted sharia-adherent Muslim may wish to enter the country without being challenged, which equates to elitist madness on stilts. See: GOVERNMENT EXHIBIT 003-0085/3:04-CR-240-G U.S. v. HLF, et al.